USDA released a flurry of reports last week, including the mid-year Cattle inventory, the July Cattle on Feed and the July Livestock Slaughter reports. The Cattle inventory report provides the first estimate of the nation’s 2018 calf crop along with an update regarding how rapidly the U.S. cattle herd is increasing. 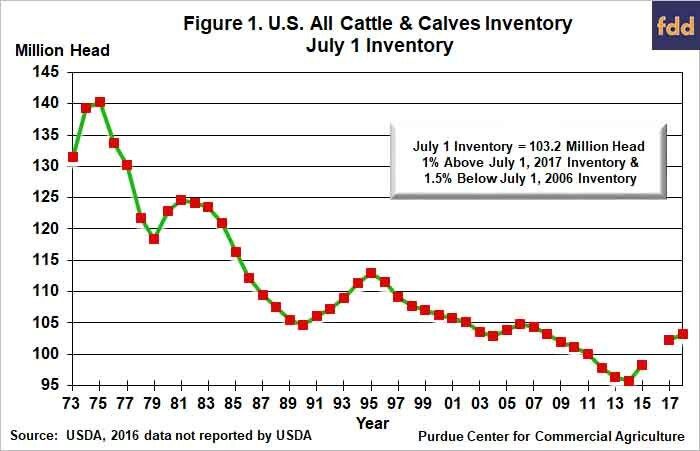 USDA estimated that the July 1 all cattle and calves inventory was 103.2 million head, 1% larger than a year earlier. Farmers and ranchers have been increasing the size of the U.S. herd since 2014, when the herd bottomed out at 95.7 million head. Although this year’s cattle and calves inventory was nearly 8% larger than in 2014, it was still 1.5% smaller than the pre-ethanol era inventory peak that occurred in 2006. 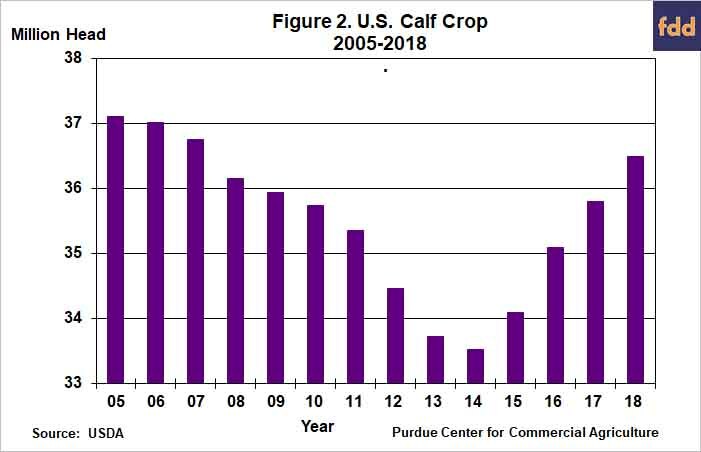 The preliminary estimate of the U.S. calf crop was 36.5 million head, nearly 2% larger than in 2017. This marks the fourth year in a row that the calf crop was larger than in the previous year. Looking ahead, heifers being held for beef cow replacement on July 1 declined just over 2% compared to last year, which is consistent with the notion that cattle herd expansion is slowing down and could even come to a halt in 2019. The July 1, cattle on feed inventory, for feedlots with over 1,000 head capacity, was 11.3 million head, which was 4.3% larger than a year earlier and nearly 9% larger than the 5-year average for July 1st. Net placements (gross placements minus other disappearance) of cattle on feed during June were up 1% compared to 2017, but were larger than typical for June, rising 16% above the 5-year average. Marketings of fed cattle were somewhat sluggish during June as marketings expressed as a percentage of the on-feed inventory fell 3% below a year earlier. Although the July on feed inventory indicates near-term fed cattle supplies will remain plentiful, the placement pattern of recent months suggests marketings could be at or near their peak now. Over the last four months placements of cattle on feed fell 4% below a year ago. All of the decline in placements occurred among heavier weight cattle as placements of cattle weighing more than 700 pounds declined 7% whereas placements of light weight cattle, those weighing less than 700 pounds, actually rose 1% compared to a year earlier. Looking ahead, weak feed grain prices this fall could encourage more placements of light weight cattle on feed, which will impact fed cattle marketings in 2019 as lighter weight placements will lead to increasing the average number of days cattle are on feed. Cattle slaughter this year has consistently been larger than in 2017. Average daily slaughter, which accounts for the difference in days most slaughter plants are operational each month, was 2% larger during January through April. However, the slaughter pace, and beef production, picked up substantially during May and June as daily slaughter volume rose 5 to 6% above a year earlier. Heavier weights pushed beef production up even more than slaughter volume would indicate as daily beef production rose 6.6% during May and 5.7% during June. The percentage of females in the slaughter mix has been increasing, providing additional evidence that cattle herd growth could be coming to an end. Cow and heifer slaughter expressed as a percentage of steer slaughter averaged nearly 83% during May and June, up from 75% compared to the same two months in 2017. During January-June this ratio averaged 90% compared to 83% last year. The rise in the female-to-steer slaughter ratio is not large enough to suggest any liquidation is taking place, but it is indicative of waning interest in herd expansion. Additionally, drought and tight forage supplies this year in two key cow-calf producing states, Texas and Missouri, could help bring expansion to a halt. One unknown hanging over all meat markets is the impact of rising tariffs on meat exports. Meat exports have been a bright spot for meat demand in recent years as growing consumer incomes in importing countries has supported increasing exports of U.S. produced beef, poultry and, especially, pork. The impact of rising tariffs on U.S. meat exports will be felt even more strongly in the second half of the year as tariffs on many products exported to China, Mexico and Canada increased again in early July. During 2017 11% of U.S. beef production was exported to all destinations. The largest U.S. beef customer in 2017 was Japan followed by South Korea (17%), Mexico (15%), Hong Kong (12%) and Canada (11%). Three of those top five destinations will be impacted by increases in tariffs on beef products from the U.S.
Fed cattle prices started the year off stronger than in early 2017 and remained above year-earlier levels through early March. However, since early March, fed steer and heifer prices have consistently fallen below levels observed a year earlier as fed steer prices in the Southern Plains averaged $116 per cwt. during the April-June quarter, 12% lower than during 2017’s spring quarter. Prices during the first 3 weeks of July averaged about $112 per cwt., 6% lower than a year ago as large meat supplies continued to depress prices. In contrast to fed cattle, prices for steer calves in the eastern Corn Belt started the year off much stronger than in 2017, primarily because prices in 2017 were very weak. Prices for 500-600 pound steer calves in Kentucky averaged $159 per cwt during the January-March quarter, 17% higher than a year earlier, before declining slightly during the second quarter to average $156 per cwt., 1% lower than during April-June 2017. Declines in corn prices have been supportive of prices for both calves and feeder weight steers this summer and are expected to remain supportive this fall. Looking ahead, fed cattle prices are expected to remain below a year ago this summer and fall as large meat supplies continue to exert downward pressure on prices. The magnitude of the decline will depend in part on how tariffs wind up impacting meat exports. Last summer fed steer prices in the Southern Plains averaged $112 per cwt. This summer prices are likely to average below $110 per cwt and could dip as low as $105 per cwt. Last fall fed steer prices averaged $118 per cwt. Large meat supplies exacerbated by weak exports could push fed steer prices down into the low teens this fall. Feeder cattle and calf prices are expected to fare better than prices for fed cattle as lower feeding costs of gain are bid into the prices for replacements. 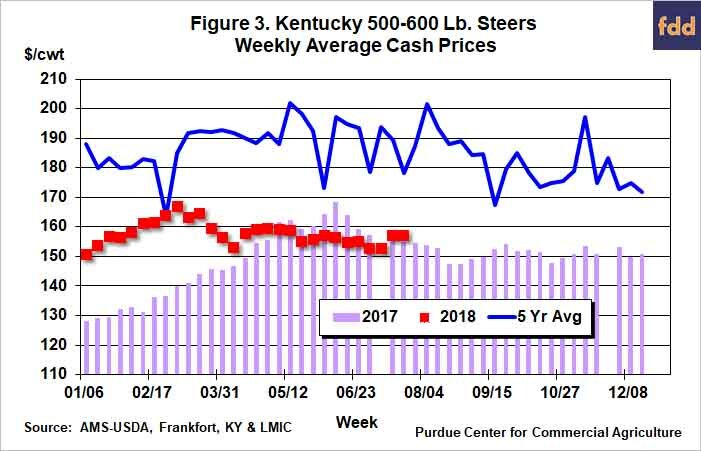 Prices for 500-600 pound steer calves in Kentucky during fall 2017 averaged $151 per cwt., nearly $25 per cwt. lower than the previous fall. Prices this fall could average in the high $140s, close to year ago levels, supported by weak feed grain prices.